This is a personal lifestyle blog... I share my opinions and beliefs pretty freely. I welcome your ideas/comments/objections/encouragement - however, please be kind and respectful. Adult conversation is always welcomed even if we have different view points. While I no longer offer advertising space and have made stricter guidelines for what I will promote and review, there are still opportunities for your brand/product to be featured on Wild and Precious blog and/or instagram feed (@blairita). 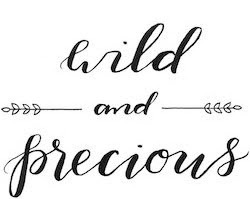 If you have questions regarding my readership and statistics or would like to be considered for partnership, please email me at blair@wild-and-precious.com. Occasionally affiliate links are used on this blog. This means that I might receive compensation by you clicking on the link and/or by purchasing something.